You have a Moonstone pendant, some Moonstone earrings or a Moonstone ring. But do you know about this fascinating gem, once believed to be solid moonlight. Moonstone is composed of two intermingled types of feldspar: orthoclase and albite. During formation, as the newly-formed mineral cools, the intergrowth of orthoclase and albite separates into stacked, alternating layers. When light falls between these thin, flat layers, it gets refracted in several directions, producing the shimmering light phenomenon known as adularescence, named for Mount Adula, a site of early Moonstone mining in southern Switzerland, just north-east of Locarno. The body colour of the Moonstone gem is most often colourless to white, but can also be yellow, grey, green, pink, brown, orange or peach, generally depending on the level of iron oxide present (which adds a reddish tinge). Moonstone can also appear in a range from transparent to opaque. Moonstone’s adularescence provides a light effect that is unrelated to the gemstone’s underlying body colour. Created by the diffraction of light as it hits thin, alternating layers of orthoclase and albite within the gem, thinner layers produce a blue iridescence, while thicker layers produce a white sheen. To the human eye, adularescence appears as an emanation of white to blue iridescent waves of light, radiating from the polished, rounded Moonstone gem, resembling moonlight, and this is how Moonstone got its name and its legends. This shimmering silvery lustre produces Moonstone’s real beauty – it’s a soft, mesmerising gloss, with subtle and soothing colour. Moonstone gems have been used in jewellery for many centuries. Moonstone amulets were connected with the legends surrounding the moon goddess Isis, of ancient Egypt. 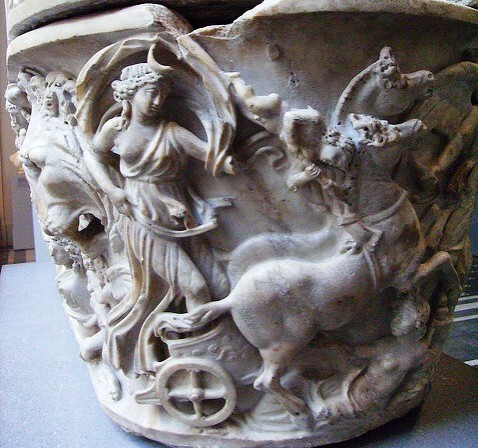 The ancient Greeks called Moonstone Aphroselene, in honour of the goddess Aphrodite and the lunar deity Selene, whom they depicted in painting and sculpture as a beautiful young girl riding across the heavens in a silver chariot drawn by two winged horses. The Romans had their own moon goddess, Diana (also goddess of nature and the hunt), whom they thought could be seen in every Moonstone gem. 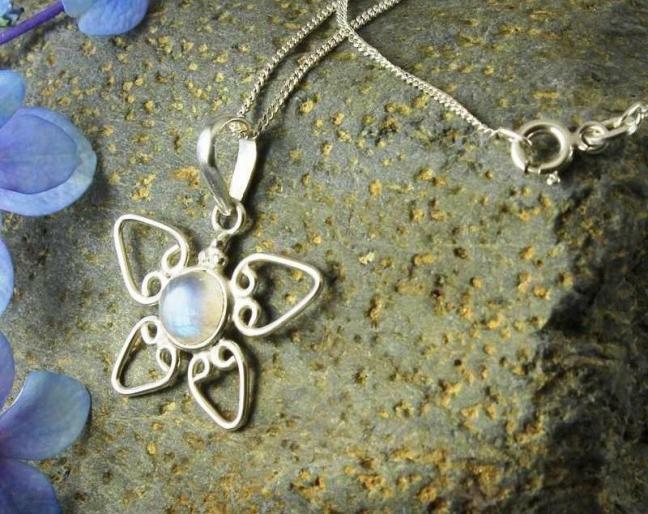 They are believed to have thought Moonstone was actually formed from solidified rays of moonlight. 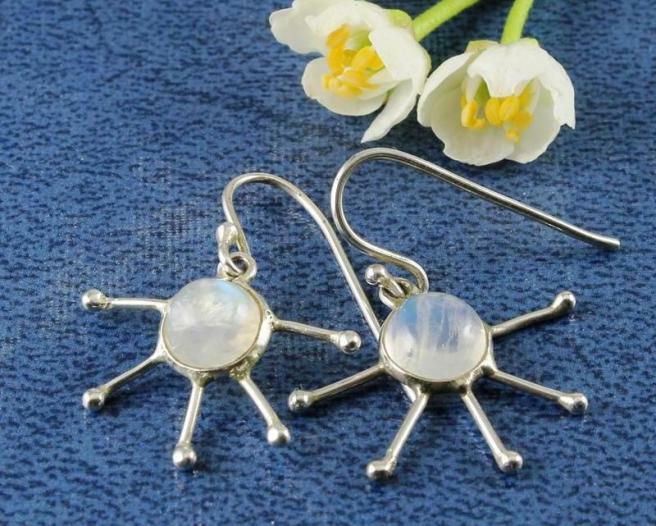 The Romans also valued Moonstone as a talisman for lovers, who wore it to arouse the most tender and sensitive of passions and to encourage true love. It was also believed that wearing the gemstone conveyed a knowledge of future events, which could wisely guide a person in making important decisions. In India, the Moonstone was considered sacred and magical, and a talisman that produced sweet and calming dreams. In many Asian countries Moonstone was said to balance the contrary forces of yin and yang and promote a greater flexibility and flow in a person’s life. Moonstone is one of the few semi-precious gemstones that has been valued by European royalty for centuries. The Art Nouveaux movement (1890-1910) saw semi-precious gemstones take over the limelight from precious gems, and this led to Moonstone being be used much more frequently for the more naturalistic jewellery that became popular during this period. 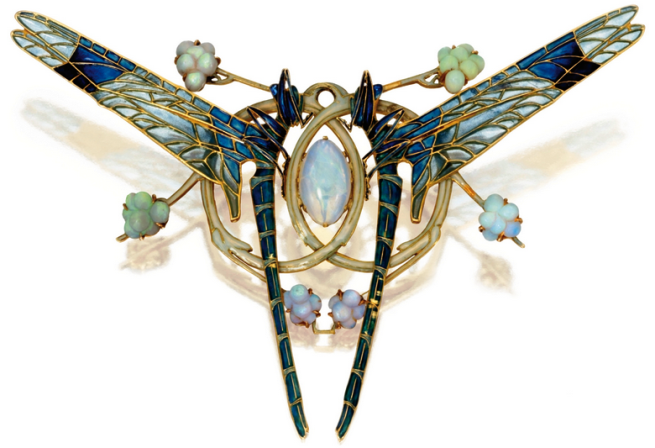 French designer-jeweller René Lalique and his peers created jewellery at this time that glorified the beauties of nature and regularly included Moonstone gems. Moonstone is currently popular everywhere, especially in Germany and Scandinavian countries, where it is preferred over the Pearl as the birthstone for June. The finest and most abundant deposits of Moonstone occur in Myanmar, India and Sri Lanka. Other deposits occur in Armenia (Lake Sevan), Australia, Austria, Madagascar, Mexico, Norway, Poland, Tanzania, and USA. Fine moonstone is quite rare and is becoming rarer every day. Moonstone which is more transparent, or has an adularescence light effect with more blue, has a higher value. Such stones mostly came from Myanmar, but since this variety of Moonstone is mostly mined out, most top grade, blue sheen, gemstones are only available today from existing stocks of dealers or collectors, and naturally enough, prices are rising. 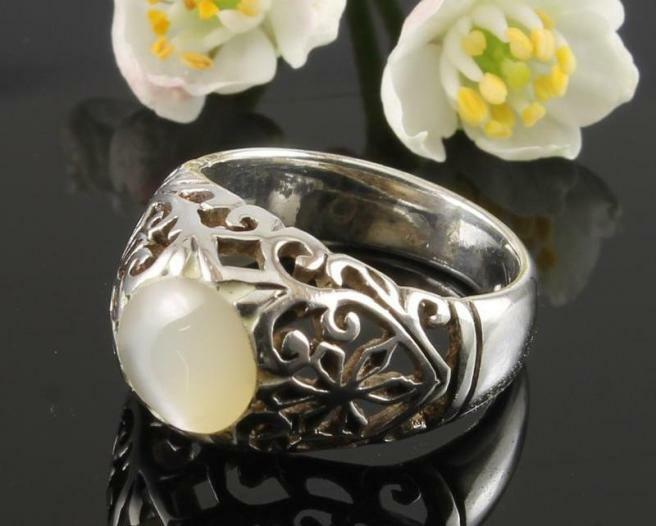 Cat’s eye and star phenomenon can sometimes be found in Moonstone, and the value of such gems will match the lavishness of their beauty, their size and their clarity. In rare instances you can find rainbow Moonstone, where the adularescent effect is multicoloured, showing blue with green and sometimes orange. Such gemstones are quite valuable. Generally moonstone is almost always cut and polished with a high dome, or convex shape, to accentuate its adularescence. Those gemstones with strong display features can sometimes reveal cat’s eye when cut in this manner. A prominent pattern of stars (asterism) is rare in Moonstone, but when it occurs the star is four pointed. Very rarely, extremely translucent or transparent Moonstones are given a faceted cut. Gem and mineral hardness is measured on the Mohs scale. The numbers are based on the relative ease or difficulty with which one mineral can be scratched by another. However, the Mohs scale is a little deceptive, since the steps between the hardness numbers are not evenly spaced. For example, Diamond (rated 10) is only one number away from gems in the Corundum family (rated 9), yet Diamond is many times harder than Corundum. 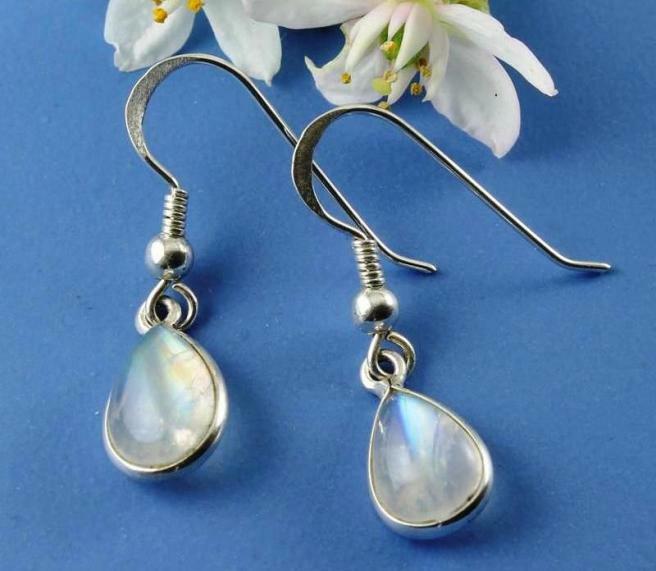 Moonstone gems are so lovely that many people enjoy wearing them in jewellery. Caution is needed in setting and wearing rings or bracelets with this gemstone, due to its relative hardness of 6 to 6.5 on Mohs scale, and its slight tendency to cleave. Moonstone has two cleavage directions, a characteristic it shares with other members of the feldspar family of minerals. Cleavage is an anomaly in the atomic structure of the gem which can makes it more prone to breaking, should it get a sharp knock or bump. 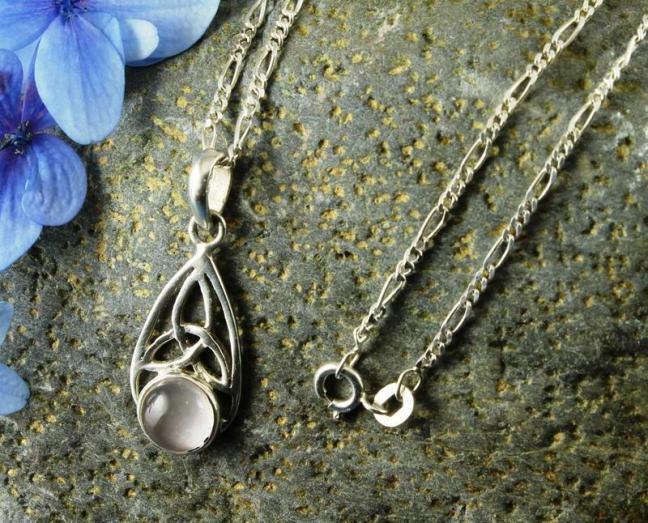 Because cleavage can affect durability, designers more often set Moonstone into pendants, earrings, and brooches, and less into rings and bracelets. 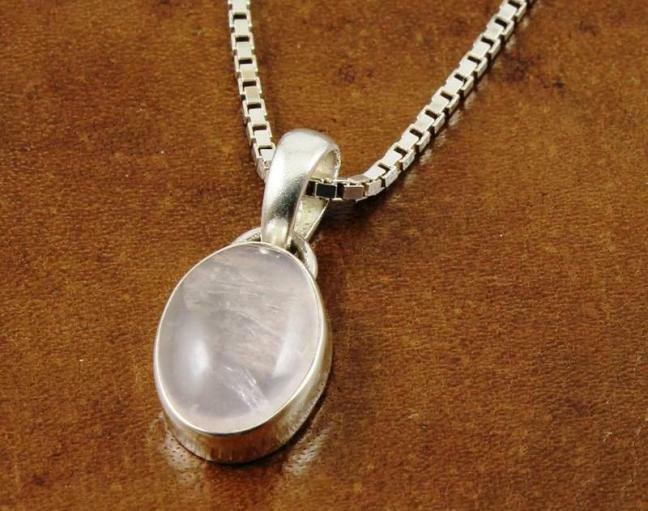 Due to this propensity towards cleavage, a hard blow can break a Moonstone. High heat or sudden temperature change can cause breaks in Moonstone. It is stable to light but is harmed by exposure to hydrofluoric acid (used in industry and pharmaceuticals). Warm soapy water is the only recommended substance for cleaning Moonstone. Ultrasonic and steam cleaners should not be used. Other than not cleaning with steam or ultrasonics and protecting the stones from hard knocks, no other special care is necessary.